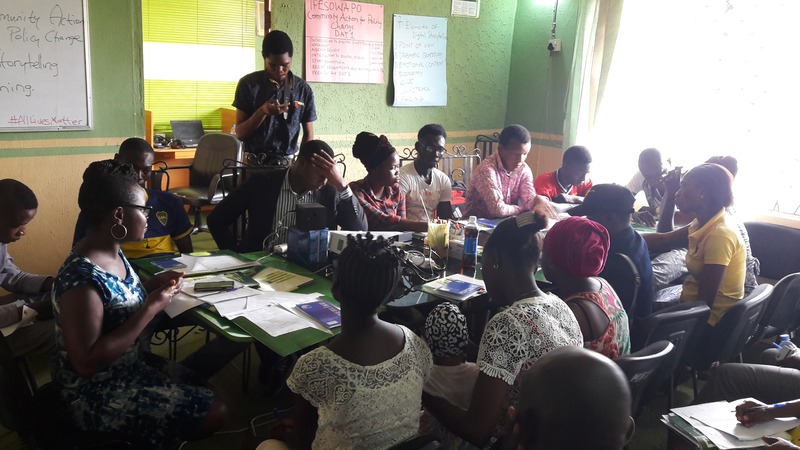 After participating in an intensive 5-day course on digital story-telling, 15 youths from informal settlements across Lagos State have learned how to produce their own digital stories about the social inequalities, extreme deprivations and forced displacement that they face everyday. 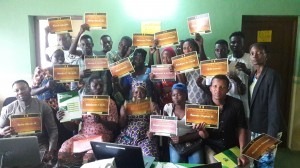 Through a 7-part process, the participants comprising 8 males and 7 females, aged 20-35 years, from Badia-East, Otto-Ilogbo, Otumara, Ifeoluwa, Ebute-Metta communities, created compelling 2 to 5 minute videos including voiceovers, static and/or moving images, that deliver a personal story. 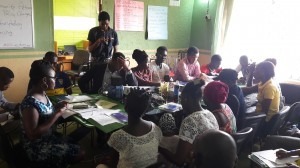 The training was conducted under the auspices of the organization’s Ifesowapo project, with support from USAID’s Strengthening Advocacy and Civic Engagement Project (USAID-SACE). Ifesowapo’s main strategy is to merge the use of trans-media tools and programs with a participatory action research (PAR) approach to build target group’s capacity to challenge and shift hegemonic narratives about slum dwellers. The PAR process, through the creation of digital stories, seeks to create a space for systemic inquiry and to amplify local knowledge in order to shift and counter the negative narratives as well as other arguments which are typically used to justify the displacement of slum dwellers. As an approach to research oriented toward solving a real-world problem or improving organizational or community-based processes and practices, PAR is designed to generate concrete action. In this context, this means addressing evictions in slum communities in Lagos. Furthermore, because one intention of the Ifesowapo project is to, “nurture new leaders with enhanced political agency and social empowerment to engage state institutions and influence changes to urban policy design and implementation,” practicing controlling one’s narrative is immensely relevant and valuable. This workshop was empowering because of the content of the stories produced. Stories covered a range of topics from the devastating impact of forced evictions to the life and death consequences of not having access to critical basic services. In addressing such a range of important issues, workshop participants exerted their power to be a part of shifting dominant narratives that vilify urban poor communities. DST Researchers argue that storytelling is a way of dealing with trauma. This was evident in the Ifesowapo workshop, as participants relayed deeply emotional stories. For example, one participant shared a story about the death of her baby sister due to a fire breaking out in her home and slow action by the Lagos State Fire Services. In her initial recounting of the story, in an attempt to create some emotional and cognitive distance, she referred to her sister as “the girl,” and she expressed no feelings about her experience, simply recounting the facts in an almost mechanical way. Michael White & David Espton, directors of counseling centre’s using narrative therapies argue that, “by re-telling one’s own story—that is by using different kinds of imagery and exploring alternative ways of interpreting one’s reality – storytelling can provide a sense of hope, belonging, and meaning for people in light of traumatic experiences.” As the aforementioned participant worked through her story over the course of the week, she began to explore alternative ways of interpreting her story. She provided more detail, shifted from blaming herself and her mother for the fire to questioning why the Lagos State Fire Services took so long to arrive, and finally, sharing her emotions about the tragic incident. After the screening of her final digital story, she remarked, “I feel sad every time I tell the story.” Through the digital storytelling process, this participant and others were able to begin working through their trauma. . The stories developed by Ifesowapo participants touched on themes as broad as police inaction and brutality, inter-communal and cult violence, the experience of being evicted multiple times, and the impact of inadequate public services. In reflecting on their stories, most participants identified the Lagos State Government as the audience they sought to reach. They also shared key insights about concrete actions the Lagos State Government could take that have the potential to tackle the root causes of the social exclusion and marginalization their communities experience. Below are highlights of some of the insights offered around recurring themes. 9 of the 15 stories produced touched on themes of police inaction and brutality, and/or inter-communal and cultist violence. Many recounted negative encounters with the police, particularly the Special Anti-Robbery Squad (SARS); others shared stories about the police colluding with neighborhood cults and perpetrators of violence. They all articulated or reinforced the idea that the Lagos State Government has a critical role to play in shifting responses and actions taken by the police. Many asserted that the Lagos State Government has already been engaged in deploying police forces in Badia East and Ebute Metta and controlling their actions in these communities. This challenges the prevailing assumption that jurisdictional boundaries prevent the Lagos State Government from intervening in the actions of the Federal Nigerian police force. Discussions of cultist violence came up as well. There was general apprehension as one storyteller mentioned the name of a cult group when recounting the violence he experienced at their hands. The fear these groups inspire was palpable as his workshop colleagues heatedly debated whether he should redact their name and blur his appearance in the version of his story that would be shared publicly. Another storyteller recounted his experience of leaving home in order to keep from being caught in the cross hairs of dueling street gangs in his neighborhood. There was a sense that neither the police forces nor the Lagos State government are particularly concerned with rooting out this cultist violence. Rather, participants felt that these institutions often contribute to the ferment caused by cult groups. Stories also called out the role of the Lagos State Task Force (the Lagos State Environment and Special Offences Enforcement Unit) plays in evictions. Workshop participants asserted that they are the agency typically involved in evicting residents from Ebute Metta and Badia East. Deutsch, Rachel. Storytelling and Trauma: Reflections on “Now I See it,” A Digital Storytelling Project and Exhibition in Collaboration with the Native Women’s Shelter of Montreal. PreviousPrevious post:Factsheet on Imo DemolitionsNextNext post:GOVERNOR ROCHAS, STOP OWERRI MARKET DEMOLITIONS NOW!